Despite our devices getting more and more powerful every year, it may be crazy to some that we still can’t run games designed for consoles released over ten years ago. Game consoles released years ago use wildly different processor architectures, which makes emulation of those consoles a difficult task for a number of reasons. The Nintendo Wii and Nintendo GameCube are two examples, as while they are similar in architecture to each other, they’re quite different from the devices we usually use. Thanks to Dolphin Emulator, we can play games from both the GameCube and Wii pretty well on the desktop, but only the highest end Android smartphones can handle that. The newly released Xiaomi Mi 9, powered by the latest Qualcomm Snapdragon 855, can emulate GameCube and Wii games like a champ. We tested legendary titles such as The Legend of Zelda: Twilight Princess, Super Mario Sunshine, Star Wars Rogue Squadron II, and The Simpsons: Hit & Run, in the case of the GameCube, while we also gave Mario Kart Wii and Super Mario Galaxy a try too. We tested all of these titles on the Xiaomi Mi 9 with the Snapdragon 855 and Adreno 640 GPU and compared performance against the Qualcomm Snapdragon 845-powered Xiaomi Mi Mix 2S (both 6GB RAM models), so we could compare two devices with a similar software experience but with a direct upgrade in processing power. We’ve already seen how the two platforms compare in synthetic benchmarks, so we wanted to see how they perform with a demanding emulator. The results and improvements in some instances are incredible. Note as well, none of these tests are done with any optimization. There are ways and means to go about optimizing the performance of emulation through the modification of settings in the Dolphin Emulator app, but we neglected to change any of that in favor of using the pre-defined settings. We just installed the latest version of the app from the Google Play Store, loaded up the games, and recorded videos of the sessions. Sadly, we couldn’t record any data using Gamebench since there were issues getting it to recognize the Xiaomi Mi 9. Although we haven’t yet tested it, we assume that the North American Samsung Galaxy S10, Galaxy S10e, and Galaxy S10+ with the Qualcomm Snapdragon 855 should perform similarly to the Xiaomi Mi 9 in terms of emulating Nintendo GameCube and Nintendo Wii games. In fact, most devices with the Snapdragon 855 should handle Dolphin Emulator pretty similarly, with minor differences due to throttling, tweaks to CPU/GPU ramping, etc. Even if you don’t own or plan to own a Xiaomi Mi 9, the videos below should be useful in gauging the performance of your future smartphone with the Snapdragon 855, like the OnePlus 7, Google Pixel 4, LG G8 ThinQ, LG V50 ThinQ, and others. An all-time favorite of the GameCube, Super Mario Sunshine is a classic. It’s fun, it’s silly, and it has a lot of depth to it. In some parts of the game, smartphones have a lot of trouble emulating it. Even just trying to go to the map can cause incredible amounts of lag. Take a look at it running on the Xiaomi Mi Mix 2S with its Qualcomm Snapdragon 845. Keep in mind that Super Mario Sunshine, from our testing, demonstrates the most subtle improvements in emulation performance. 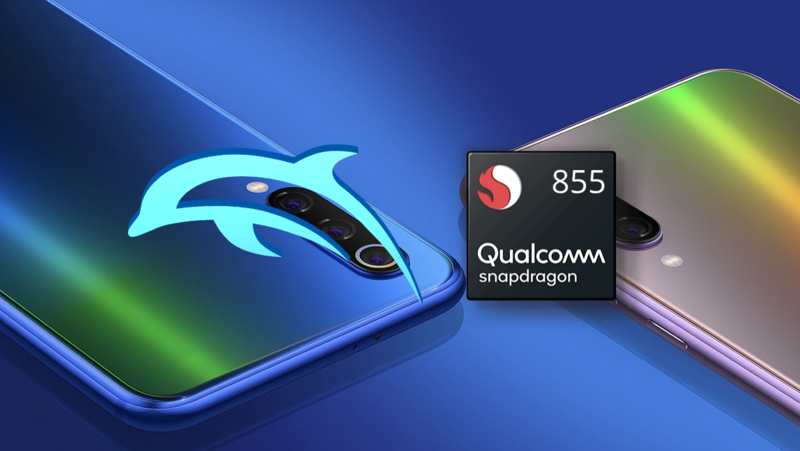 Now, compare that to how the Xiaomi Mi 9 with its Qualcomm Snapdragon 855 handles Super Mario Sunshine. The differences in Super Mario Sunshine emulation are subtle, however, they are noticeable. The audio crackles a lot less on the Xiaomi Mi 9, and the map opens a whole lot quicker. If you think that this isn’t a big enough improvement, check out the other games below. A game that has proven difficult to emulate in recent years is The Legend of Zelda: Twilight Princess when it comes to Android smartphones. It’s a huge game and can prove a difficult task for our smartphones to emulate. You can see that below from how the Xiaomi Mi Mix 2S with the Snapdragon 845 handles it. It’s certainly playable, but it lags, the audio crackles and the loading times can, at times, be pretty long. Observe the game below, running on our Xiaomi Mi Mix 2S. Now, compare that to the Xiaomi Mi 9 with its Snapdragon 855. You can notice the difference specifically while in Ordon Village. The Legend of Zelda: Twilight Princess lags a whole lot more on the Xiaomi Mi Mix 2S while there, however, the Xiaomi Mi 9 powered by the Snapdragon 855 handles it like a champ. While definitely not a huge difference, it’s noticeable and bodes well for later on in Twilight Princess as well. Earlier levels will usually be less taxing computationally, so what may seem like a small amount of lag in the case of the Xiaomi Mi Mix 2S may soon become unbearable in later levels. This is where the Xiaomi Mi Mi 9 thrives and shows that it doesn’t struggle with the basics. An older favorite of mine from the PlayStation 2, this has been a game I’ve personally kept a close eye on for Android emulation. It basically doesn’t run on devices with the Qualcomm Snapdragon 845—certainly not in a usable state. It’s just incredibly frustrating to try and play. Take a look at our video of testing it on the Xiaomi Mi Mix 2S. You’ll see what I mean. As you can see from the video, lag is absolutely everywhere and it is extremely annoying to navigate and control. The frame drops mean that input is also delayed. This was one of my childhood favorite games, but it’s just too frustrating to play. Now, take a look at it on the Xiaomi Mi 9 with the Snapdragon 855. As you can see, the difference in practically all aspects of the game is incredible and it is, more or less, night and day. Loading times are faster, audio is less distorted, and the game doesn’t randomly lag without reason. It’s near flawless, while the Xiaomi Mi Mix 2S struggles to keep up in both audio and video performance. The Simpsons: Hit & Run demonstrates the most obvious improvement of all three games that we’ve tested here, and really drives home just how much better the Qualcomm Snapdragon 855 on the Xiaomi Mi 9 is for GameCube and Wii emulation. A notoriously difficult game to emulate, Star Wars Rogue Squadron II proves just as difficult to emulate as expected on the Xiaomi Mi 9. I’d argue it’s not even really playable, but you’re welcome to give it a try if you want to see how it runs on your smartphone. Just keep in mind, if the Qualcomm Snapdragon 855 can’t keep up, it’s unlikely anything else really will either. An all-time favorite of many, Super Mario Galaxy is a classic. Thankfully, the Xiaomi Mi 9 can definitely run it, though you’ll need a third-party controller to get past the opening level. That’s because you need to execute a Wii Remote shake, something that you have to bind to a button on a controller. Still, you can check out footage of the game above. There are definitely some inexplicable slowdowns, though I don’t know how widespread throughout the game those are. The music, along with the rest of the audio, comes through clearly most of the time. That’s what matters about Super Mario Galaxy, right? Mario Kart Wii is probably the most popular title I’ve tested that works nearly perfectly. Apart from that square rectangle up in the top left, the game plays excellently. Even the touch screen controls are pretty easy to navigate with two hands, even while driving. It’s pretty impressive. Obviously, it’s even better with a controller. While some games were okay on the Qualcomm Snapdragon 845, the upgrade to the Qualcomm Snapdragon 855 lets them run near flawlessly. On top of those games, we also tried Super Mario Galaxy and Mario Kart Wii. Both have their own issues which are why we didn’t show them off here, but they do technically work. Mario Kart Wii has a strange graphical glitch which would appear to be an issue with GPU drivers, while Super Mario Galaxy would appear to be a lot easier to play with a controller. Sadly, the Xiaomi Mi 9 does not support a wired Xbox controller out of the box via OTG, though you should be fine with a Bluetooth controller. Other than that, Mario Kart Wii ran flawlessly and Super Mario Galaxy only suffered occasional slowdowns from 60FPS. Nintendo GameCube and Wii emulation on Android is in a pretty great place right now, and it can only get better from here. You can download the official Dolphin Emulator for GameCube and Wii games from the Google Play Store below. Note that you will have to legally obtain valid dumps of the games yourself.